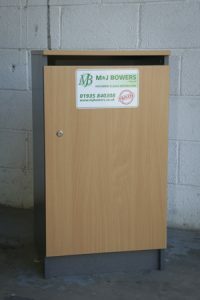 M & J Bowers are the leading providers of On-Site Shredding & confidential waste destruction in the South West. High level security shredding of your confidential material on site is the quickest and most secure way to destroy your confidential documents. 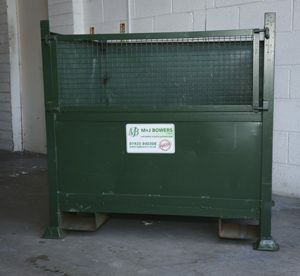 M & J Bowers’ mobile shredding lorry, The Big Green Destruction Machine, will come to your premises and destroy confidential waste and sensitive documents while you watch. There is no need to remove staples, paperclips, wallets, etc. – we simply deposit the material to be destroyed into the machine and our state-of-the-art shredder will do the rest. 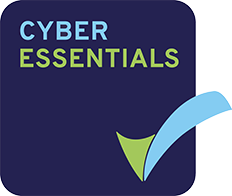 You will be issued with a Certificate of Destruction as proof of your compliance with a confidential waste destruction strategy. The shredded material is then returned to our Somerset depot where it is baled and sent off for recycling into a variety of paper products. 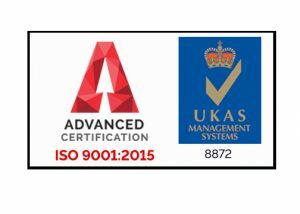 To comply with data protection requirements in the handling of confidential waste, all of our staff members are DBS & vetted & Screened to BS7858 they are also trained to BS EN 15713:2009 Secure Destruction of Confidential Material. We believe our mobile shredding prices are the most competitive in the South West and guarantee to improve on any legitimate written quote you receive. Please contact us to discuss your mobile on site shredding requirements. 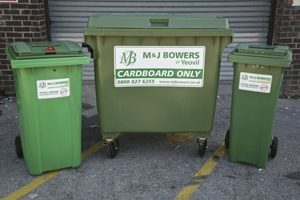 Cardboard recycling and paper destroyed as M & J Bowers Ltd offers a service near you. When you are looking for sensitive document collection companies, pick M & J Bowers for a speedy and cost effective service to shred your sensitive documents, company data or textiles with your company logo. Document collection in one or more of our collection bins for on-site shredding for secure confidential destruction and recycling of all office waste documents. Yeovil, London, Plymouth, Devon, Wiltshire and Bristol onsite sensitive and confidential waste management. 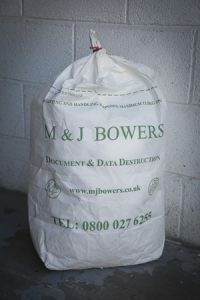 M J Bowers on-site document destruction offer a commercial shredder service and secure container bins for on-site collection of your textiles with sensitive company logo and office waste. Confidential waste collection bins will be delivered to your office or household for the collection of sensitive waste paper products and textiles to be recycled. Locking our secure containers is easy with speedy collection or use our ready onsite shred service for immediate destruction.